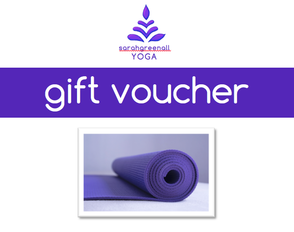 Yoga Classes - SARAH GREENALL YOGA - Space to stretch, breathe and relax. YOGA CLASSES - Experience the benefits of yoga as I ease you from a mode of "doing" to a state of "being". My classes start and end with a lovely relaxation and in between I will guide you through a sequence of stretches and postures that build up to a peak pose before winding down to the final relaxation. I place a strong emphasis on the breath, mindfulness and relaxation leaving you feeling both refreshed and relaxed but, at the same time, having allowed you to stretch and challenge your body to the level you want. MEDITATION CLASSES - Let me guide you through some mindful movement and breathwork before leading you in a guided meditation to bring some calm to your day. ​To find out a little more about yoga, click here to go to "About Yoga". For advice as to what to wear and what to bring, scroll down to the bottom of this page. These are drop-in classes which run on Wednesdays and Thursdays, 9.30am-10.45am in Hampton Hill. They are suitable for anyone who has practised Yoga before. The Summer Term starts on 24th April 2019. Please note if you are a complete beginner and this is the only time you can make then do get in touch to discuss, email sarah@sarahgreenall.com. Suitable for all levels (including beginners), these are drop-in classes which run on Mondays 7.15pm-8.30pm in Hampton Hill and Fridays, 9.30am-10.45am in Long Ditton. The Summer Term starts on Monday 29th and Friday 26th April 2019. These are drop-in classes which run on Thursdays, 11.30am-12.45pm in Hampton Hill (please note the new time). The Summer term starts on 25th April. These classes are perfect for anyone who prefers a slower pace of class. Also suitable for anyone recovering from injury or illness. These are drop-in classes 10.50-11.20am on Thursdays in Hampton Hill and Fridays in Long Ditton. A discount is offered if you combine it with a yoga class. The next Beginners Course will start in September 2019. Email me at sarah@sarahgreenall.com to register your interest. - Please wear loose, comfortable clothing and it is a good idea to wear layers and socks as you will need to keep warm when lying in relaxation but you might get warm when working through the posture work. ​Please leave your shoes at the side of the hall/studio. - It's best not to eat a heavy meal before class and ideally not eat anything for 1-2 hours before class. - I have mats but if you have your own please bring it. I have props and also blankets for our relaxation but again, feel free to bring your own. - My classes start promptly so please aim to arrive in good time (but no earlier than 15 minutes before the start of class). - Please remember to switch your mobile to silent. - Please inform me if you suffer from high or low blood pressure, heart disease, retinal problems, epilepsy, have a joint replacement, are pregnant or have recently undergone any major surgery. It is always wise to consult your doctor prior to beginning a yoga programme. Please inform me if you have any new injury or health condition that was not previously declared. - If you are likely to be late or are not able to come to class, a courtesy text would be appreciated 07952 931 383. - As a sign of respect, please do not tread on mats with shoes on or walk across other people's mats. - If people are already lying in relaxation when you enter class, please keep your voice low. If you would like to come along to class, please download this form and fill it out. If you have Adobe Reader (or similar) you should be able to edit it online and email it back to sarah@sarahgreenall.com. Otherwise you could print it out, fill it in by hand and either scan it or take a picture of it to email/text back.